This week we take a look how you can convert an all grain recipe to malt extract (or back). The majority of brewers (perhaps 70%) brew with malt extract recipes, though most serious enthusiasts have made the switch to all-grain. Yet it is the small percentage of expert brewers who write all of the brewing books and publish a large portion of recipes online. This can leave many extract brewers out in the cold. Converting a recipe is best done with the aid of brewing software or a good spreadsheet since you need to be able to adjust the original color, IBUs and original gravity estimates. At the end of the article, I will cover exactly how to do this using our software in a single step. However, I believe it’s important to understand what’s going on under the hood. For the first step, convert your base malt to extract. 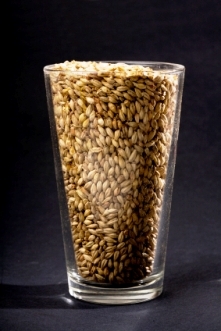 The base malt is easy to identify as it is the largest ingredient in the beer – typically 5-10 lbs of pale malt. For example, let’s look at an all-grain ale with 8 lbs of pale malt and 1 lb of crystal malt. The simplest base malt conversion is to just multiply the number of pounds of pale male by 0.75 to get the pounds of liquid extract. Therefore 8 pounds of pale malt becomes 6 pounds of liquid extract. An equivalent conversion for dry extract is 0.6, so 8 pounds of pale malt becomes 4.8 pounds of dry malt. A more accurate conversion would actually take the potential of the grain and extract into account when converting malt, but I will leave that topic for a future article. To simplify things, we leave the specialty malts (1 lb of crystal) alone and switch to steeping them instead of mashing them. Some specialty malts (notably wheats, Munich malt, flaked and terrified grains) cannot be steeped and need to be replaced with a reasonable substitute. For example, those grains listed in our online grain listing as “must mash” should not be steeped. The same is true if you have a large proportion of specialty malt. A good rule of thumb is you should steep no more than 3-5 lbs of specialty grains in the final extract recipe. Obviously you want to choose your malt extract to match the original color and style of the beer. If you are converting a wheat beer, choose a wheat extract. Beers with large amounts of Munich malt require a Munich extract. If you are making a light colored beer, pick the palest extract you can find. Pale extract is always a good starting point. Once you have your base malt converted, the next step is to match your color. Malt extracts are almost always darker than the equivalent pale malt due to darkening in production and storage, so you will need to reduce the color and quantity your specialty malts to match the same color as the original beer. To manually calculate the color of both your original beer and the final beer you can view our article on beer color. However, I recommend using your favorite brewing software or a spreadsheet to simplify the process. If you don’t have home brewing software, the best way to come up with the same color as the original is really by trial and error. You can swap the existing specialty grains with lighter color grains (try 40L Crystal as a substitute for 60L Crystal malt for example), or you can reduce the amount of your darker colored specialty grains until you match the color of the original recipe. Some very light colored beer styles such as Koelsch may be impossible to precisely match using malt extract simply because commercial malt extracts are much darker than equivalent pale malt grains. In these cases, try to get as light as you can and consider using malts such as Carafoam (if appropriate) to replace crystal malts if appropriate to further reduce the color. The last step is to match the bitterness (IBUs) of the original beer. When going from all grain to extract this involves adding more hops because partial batch boils result in lower hop utilization than full batch boils used by all grain brewers. Some use a rule of thumb such as “add 20% more hops” but it is far more accurate to calculate and match the IBUs for both versions. Again a spreadsheet or program is needed to calculate the International Bitterness Units (IBUs) of the original beer and final beer. Don’t use HBU’s (Home bitterness units) here since the boil sizes between all grain and extract brews are much different. Before starting, make sure you have the correct boil size both for the original beer and converted recipe set correctly when calculating IBUs. All grain brewers use full size boils (6+ gallons for a 5 gallon brew), while extract brewers use much smaller boils (perhaps 2-3 gallons for 5 gallons of beer). This has a large effect on IBU calculation. Once you have both calculations set up, simply increase the hop additions incrementally until you reach your target bitterness. You now have an extract beer recipe that will closely match your all grain recipe. You can use the above three step guide with any brewing software or well designed spreadsheet to manually perform the three steps (convert base malt, adjust color, adjust bitterness). If you wish to convert back (extract to all grain), you can follow the same three steps, but this time divide by the conversion factor (6 lbs of pale extract/0.75 = 8 lbs of pale malt). BeerSmith has a nice conversion wizard built in to do all three steps in one shot. Open the recipe you want converted, click on the ‘Convert Recipe’ toolbar button (or “Convert Recipe Wizard” on the “Actions” menu). Select the type (All Grain, Extract, Partial Mash) of conversion you wish to perform. Pick the target equipment profile you wish to convert to (since your extract equipment likely has a much smaller boil pot) and press the OK button. The program will perform all three steps and give you the finished recipe. It is a very handy feature if you have recipes from a book or the web that you wish to convert quickly. Thanks for tuning in to the BeerSmith Home Brewing Blog this week – I appreciate your continued support of the blog. Please consider subscribing for regular weekly delivery of articles by RSS or email if you enjoyed our blog. Beersmith’s calculations are awesome. I tweak and build recipes all the time, sometimes from scratch. The recipe conversion tools are somewhat crippled by a very shallow ingredients database. I’ll give an example of where I couldn’t use BeerSmith: I received a gift of a partial Mash extract recipe from the local homebrew shop. Their recipes call for 1.5 gallon boils with more water added later. I always do full boils. The fact that BeerSmith can (usually) convert this for me is awesome. The first problem I hit is, there’s nothing in the Extract database for “Munich Malt”. Well, I can -make up- SRM, potential SG, but this is a let down. NB, B3, and the local homebrew shop all sell this type of extract, but BeerSmith only has entries for grain users. A pity, since it would probably be trivial to flesh out the database in an online update. The recipe you have mentioned in your post is very attractive and also seems awesome. Keep it up this kind of work. Nice details about malt extract from whole grain. What really makes this article special is the thrust is not only given on the taste but also on the color as color creats the first impression. A bit daft suggesting the Beersmith SW & not providing a link or the cost?? 1) how to select quantity & manage the grain malt extraction. 2) You don’t seem to worry about this, but a similar approach to the selection & management of hops, bitterness, aroma & taste. Bitterness is the step I struggle with most & so many recipes followed correctly just don’t provide the desired result & almost always fail to say what the final bitterness is.